This simple, solid abode has all the essentials of a great family home; chic entertaining areas, great storage and a bright interior with chunky wooden features. But the most striking aspect is undoubtedly the fresh, modern design. The home is composed of two simple rectangular volumes which have been overlaid to create a two-level home with a simple division of living spaces. The exterior is otherwise quite minimalist, so this feature also gives the home interest and variety. The windows are large and once we enter the home, this translates into an interior with a bright, sunny ambience. 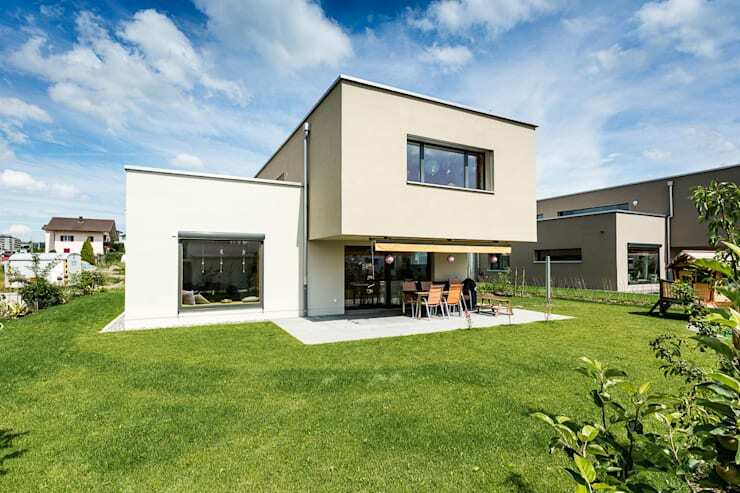 This is certainly a home for those who want a simple family dwelling with a fresh modern feel. It is brought to us courtesy of Swiss architects Hunkeler Partner. So come with us on a photo tour to learn more. Enjoy! The relationship between the two simple building masses creates ample opportunity to make the most of the green surroundings. On the ground floor we have a lovely window seat and a great outdoor area. The overhang from the upper level mass creates a very simple boundary around this outdoor dining area. It is a simple aspect, but one that defines the sparse and approach to this unfussy home. 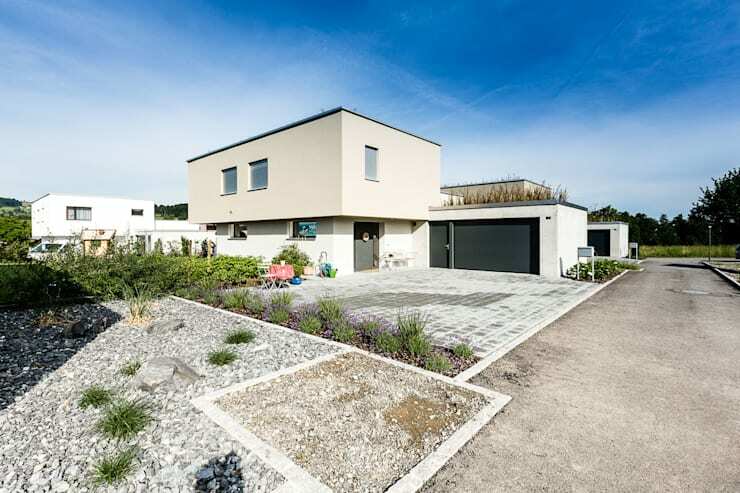 The home is designed for a rather large and generous building plot, so the architects have made the most of the space with a large double garage. The slight overhang from the upper level creates some shade over the entrance and side of the home. The abode is one in a new building complex and the exterior is rather private. 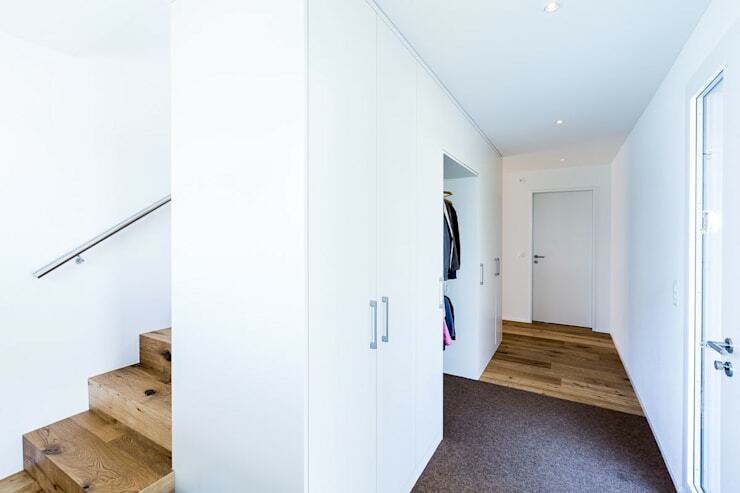 The hallway has been narrowed to create a series of built-in storage spaces. These add little visual weight to the room and help retain the bright and minimalistic feel of the space. Note the chunky wooden risers of the staircase on the left. The hallway might be bright and white, but the rich tone and variation in the wooden floors makes the entrance feel very warm and welcoming. 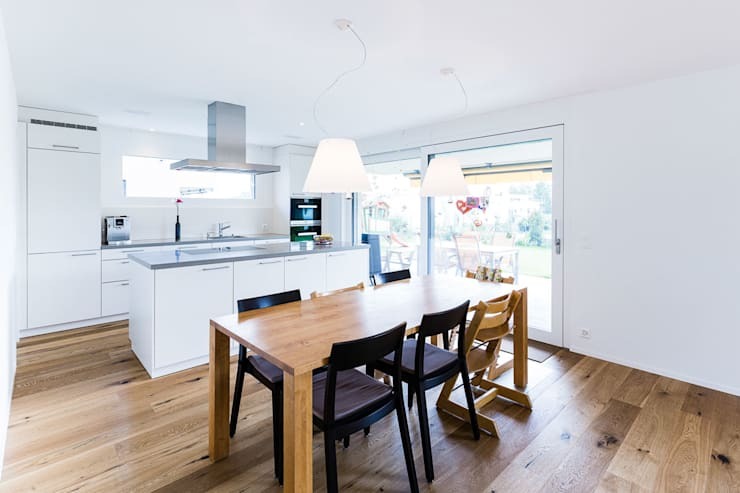 The combined kitchen and dining room have a simple balance of minimalism and warmth. The white kitchen cabinetry contributes to the simple functional feel of the space, while the eating area introduces warmth and texture. We love the mismatching wooden chairs. They add that little more variation and texture to the area. Also, note the narrow high-set window in the kitchen. As mentioned earlier, the home is built to be one in a complex, so this helps the occupants retain privacy. The passageways and hallways in this home are bright and uncluttered. See how the large window on the right floods this area with light. As in the rest of the home, the decor here is extremely simple and offers a very subtle combination of colours and textures. This gives the home a Scandinavian style warmth, without sacrificing the spacious and earthy feel so important in a family home. Finally, note the generous proportions of the doorways. This makes the home feel that little bit larger. 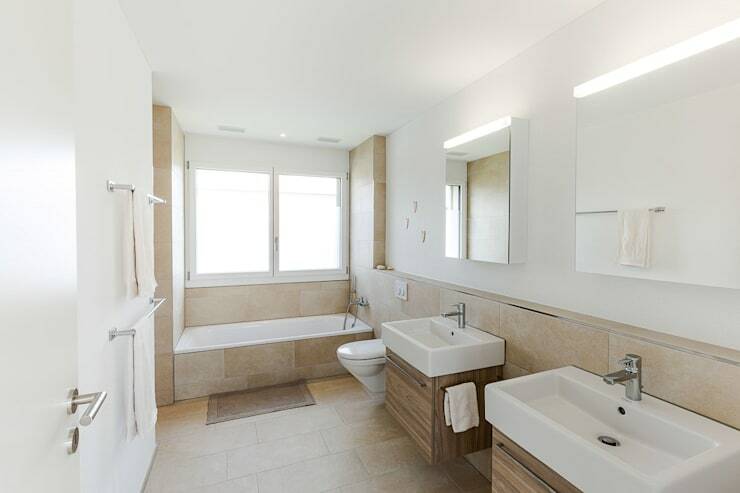 The large bathroom is replete with subdued natural textures. It also has his and hers washbasins and a large bathtub. 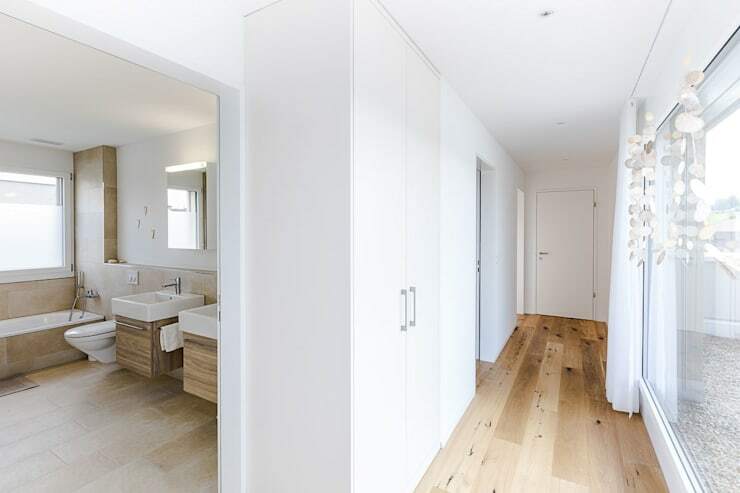 The cabinets have been suspended off the ground to create a more spacious feel and the bathroom is brightly lit. But our favourite part is the tiled-half wall that protrudes to create a long and simple storage shelf. This is certainly a home for those who love simple functionality. For more family living inspiration, take a look at A modern home of eclectic charm. What do you think of the bright modern ambience of this simple family home? Let us know in the comments field below!